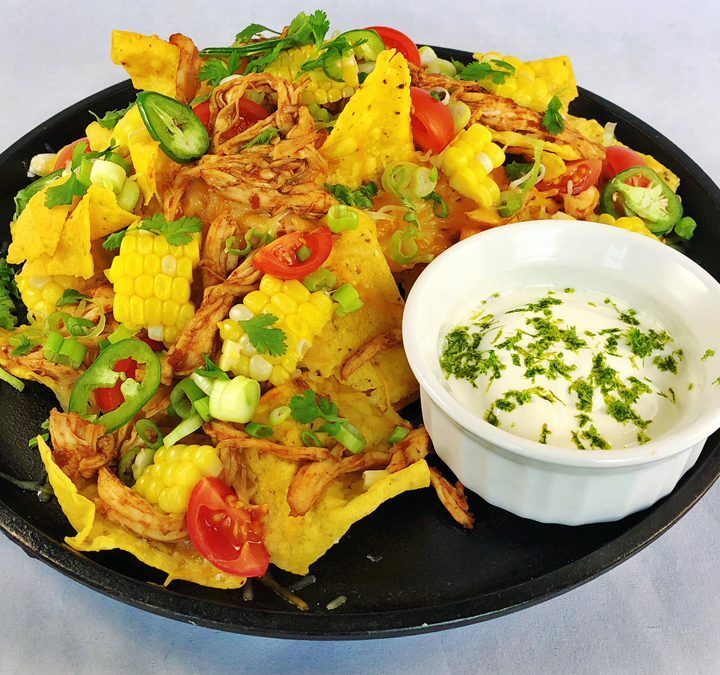 Create these tasty nachos using up any shredded leftover BBQ meat – chicken, pork, or beef. Just toss the meat with your favorite sweet BBQ sauce and top over tortilla chips. Add lots of cheese, green onions, jalapenos, cherry tomatoes, and fresh grilled or roasted corn off the cob. Shred the meat with two forks, add the BBQ sauce and mix thoroughly. Thinly slice the green onions and jalapeno, cut the cherry tomatoes into quarters, and removed the grilled corn from the cob; set aside. Preheat the oven to 400ºF. In an oven-proof pan or cast iron comal pan add a layer of tortilla chips. Top the chips with 1/3 of the cheese, chicken, green onions, jalapeno, tomatoes, and corn. Repeat with two more layers of chips, cheese, and toppings. Place in the oven and bake for 15 minutes. While the nachos bake, whisk together the sour cream with the lime juice. Place in a serving bowl then top with the lime zest. Remove the nachos from the oven and top with the fresh chopped cilantro. Serve the sour cream with the warm nachos.